if you have old Light bulb don’t throw, use it again. We all know better light bulb that has been broken, should not be thrown away. But what can we do because it confused too, should be discarded where else? Finally thrown in the trash in front of the house? Trash bulb is difficult to disentangle the waste naturally, because they contain chemicals and glass, if not processed correctly will be an impact bad for the environment and our lives. So from now on do not waste bulb ya …. 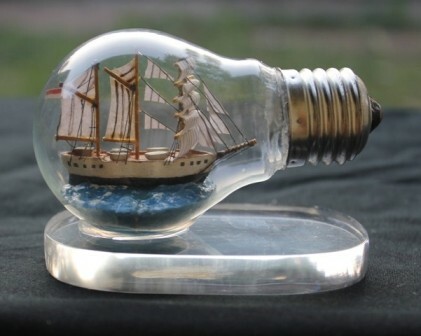 Here are the results of his own works with former memanpaatkan bulb, a little patience and effort creative ideas finally managed to make a ship in a bulb.